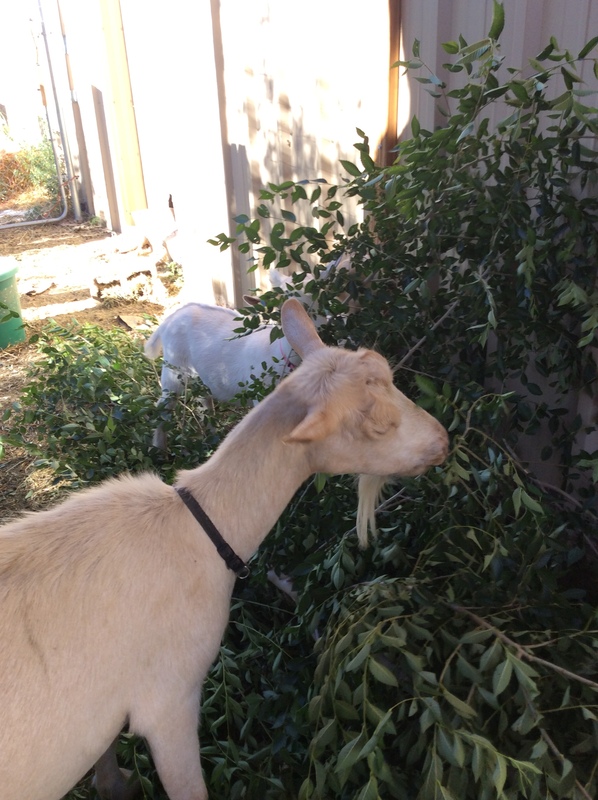 This is a poignant post for me to write, because one of my very first posts written on this property was about my new Sanaan doe goat Magnolia. Beloved Maggie is over nine years old now, and no longer holding body weight well when she’s in milk, and I’ve concluded that for her own good, this is her last lactation. So I’m filling the freezer with goat cheese, and Magnolia will retire and live out the rest of her life in leisure. 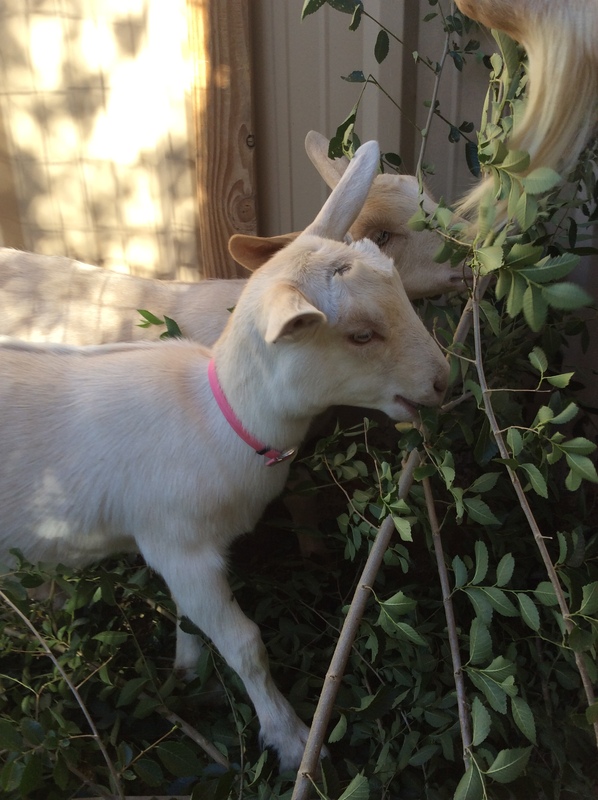 Goats are smart and interactive and, like dogs, incredibly painful to lose. I hope that Maggie will be with us for a few years yet. She is a big part of my daily life, and I can’t think of a better subject for my 300th post. If you are interested in having a dairy animal, bear in mind that they need excellent nutrition and eat a lot of expensive food and occasionally have veterinary needs, so don’t even think in terms of producing economical food. Think in terms of having a lovely pet, with benefits. Do remember that periodic male offspring are almost inevitable and you have to have a plan for what to do with them, so if you are vegetarian yourself this may be a real issue for you. Female offspring can often be given to good homes, but can very seldom be sold at a profit. Also, I trust it goes without saying that when in milk they have to be milked out every day, not just when you feel like making cheese, and have to be milked when you travel, which is not a job that the average pet sitter will take on. Be aware that excellent fences are required to keep goats out of your own shrubbery and trees or your neighbor’s, and in my area an 8 foot fence they can be secured behind at night is needed for protection from coyotes. All of this costs money. 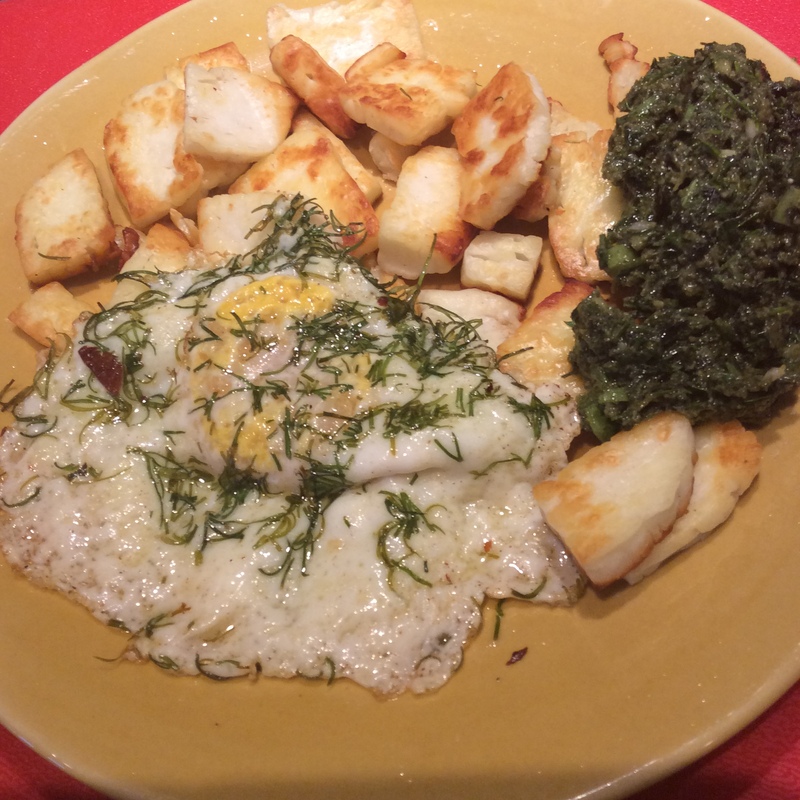 If any of this discourages you, there is an abundance of excellent cheese including the superb Mount Vikos halloumi available at any upscale food store or co-op. One of the reasons that I wanted a dairy animal in my suburban yard is that I like to make cheese, and currently it’s pretty hard to make cheese from most commercial milk. This is because milk is being pasteurized at increasingly high temperatures to extend its shelf life, and the milks in your local dairy case that don’t say “UHT” were probably still pasteurized at near-UHT temperatures. This affects the proteins, and such milk will not form a proper curd when rennetted. Therefore, unless you have access to fresh-from-the-animal milk, success is by no means certain with any cheese recipe except ricotta. Since it’s illegal or very difficult in most areas to sell raw milk, a dairy animal is your ticket to cheesemaking. If you don’t have a dairy animal or access to milk that wasn’t processed at high temperatures, I am very sorry to say that I do not recommend cheesemaking because it is going to be too disappointing. Personally, I find it absolutely weird to think that most commercial milk is so denatured that you can’t make cheese out of it. But these are the facts. If you have access to clean milk that was not pasteurized at high heat, go immediately to Ricki Carroll’s wonderful cheesemaking site and go to town. 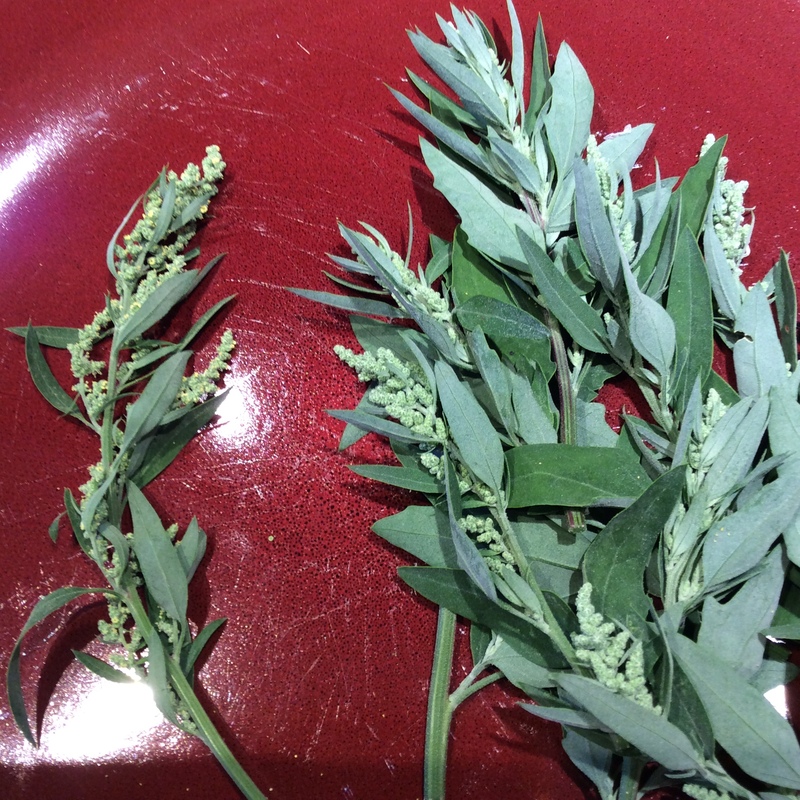 She has all the supplies and cultures as well as reams of recipes and advice. 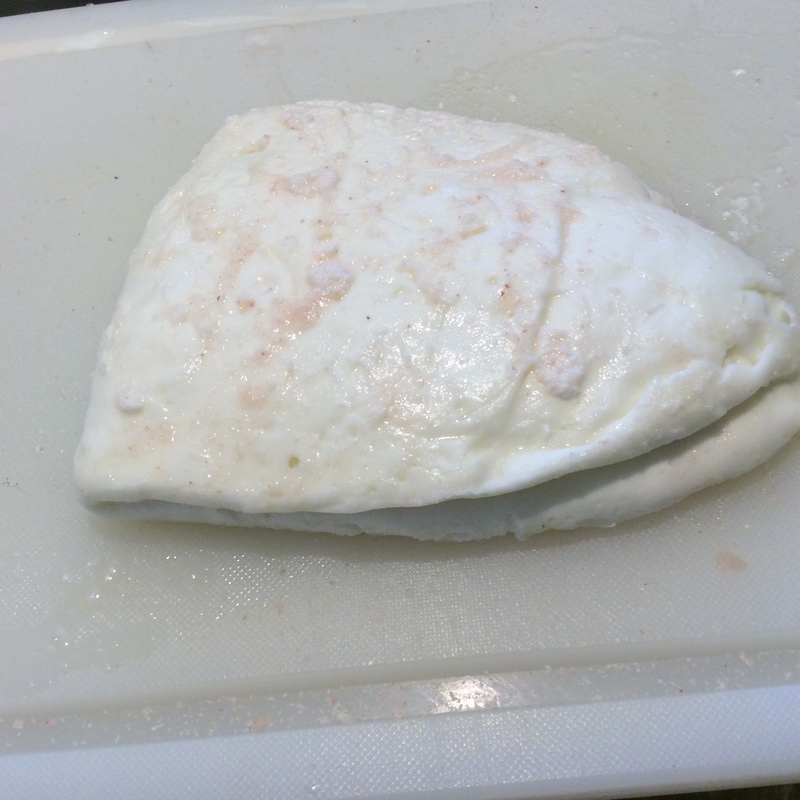 My own choice has been to stick to fresh cheeses and halloumi, because they are quick and easy to make, can be frozen for later use, and do not require any special attentions as they age because they don’t age. I’m especially fond of halloumi because it can be grilled to such a wonderful crusty brown, and I do love a good Maillard reaction. 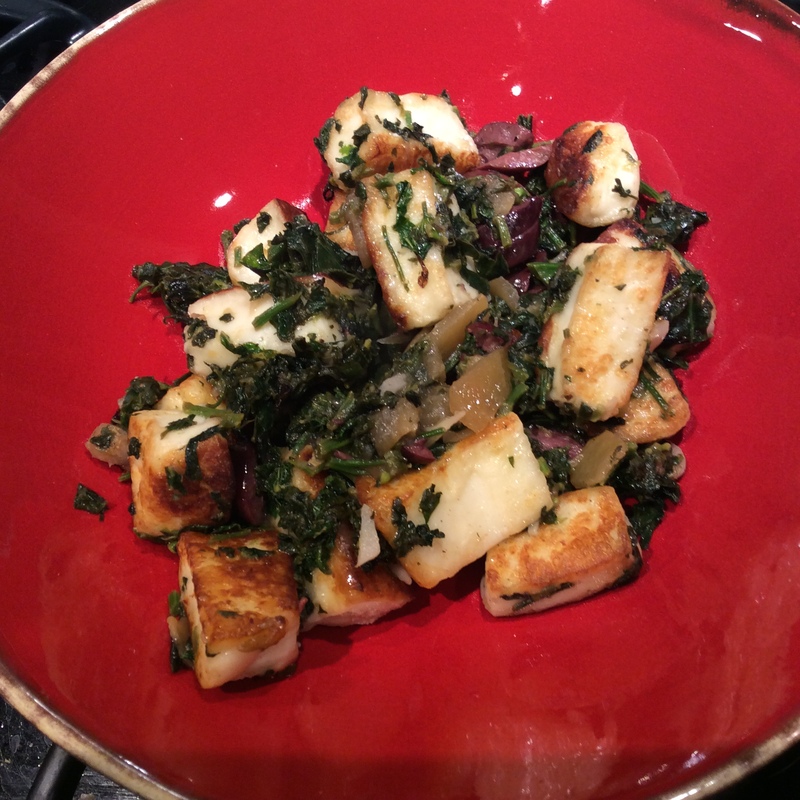 Rather than give my own haphazard procedure for making halloumi, which might not be perfect but fits into my kitchen routine and produces a good product, I am going to have you start off on the right foot by linking to Ricki’s recipe. 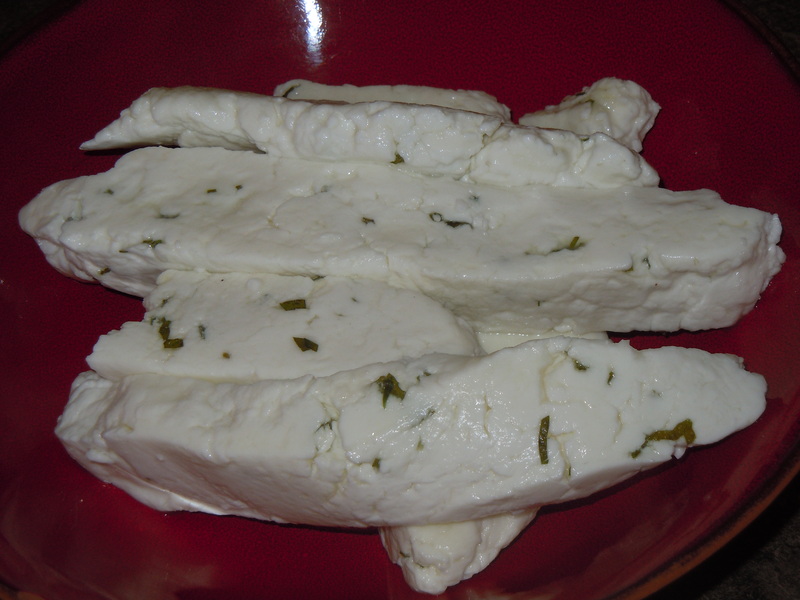 I will only add that I don’t use any herbs in finishing the cheese, because it is more versatile if it isn’t already carrying an herb flavor. 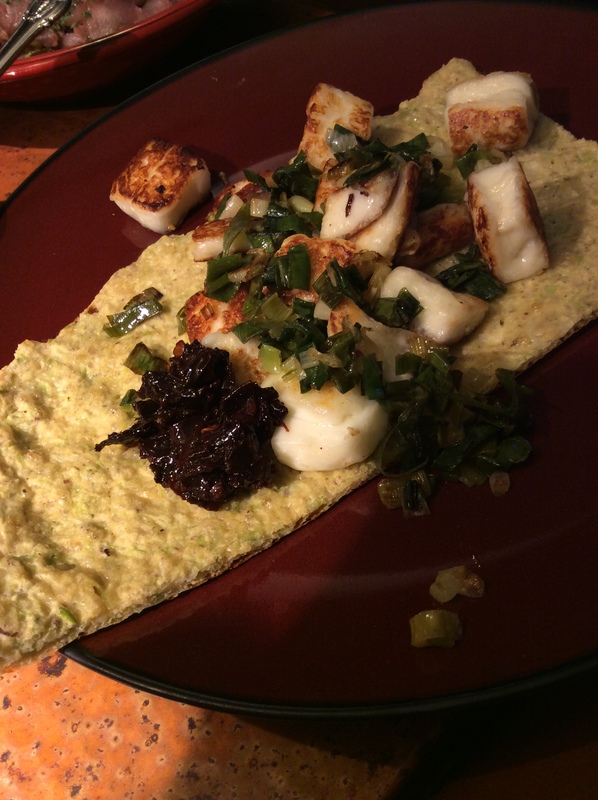 Any herbs that you want can easily be added at the cooking or serving stage, as the green onions pan-grilled with the halloumi in the top picture. 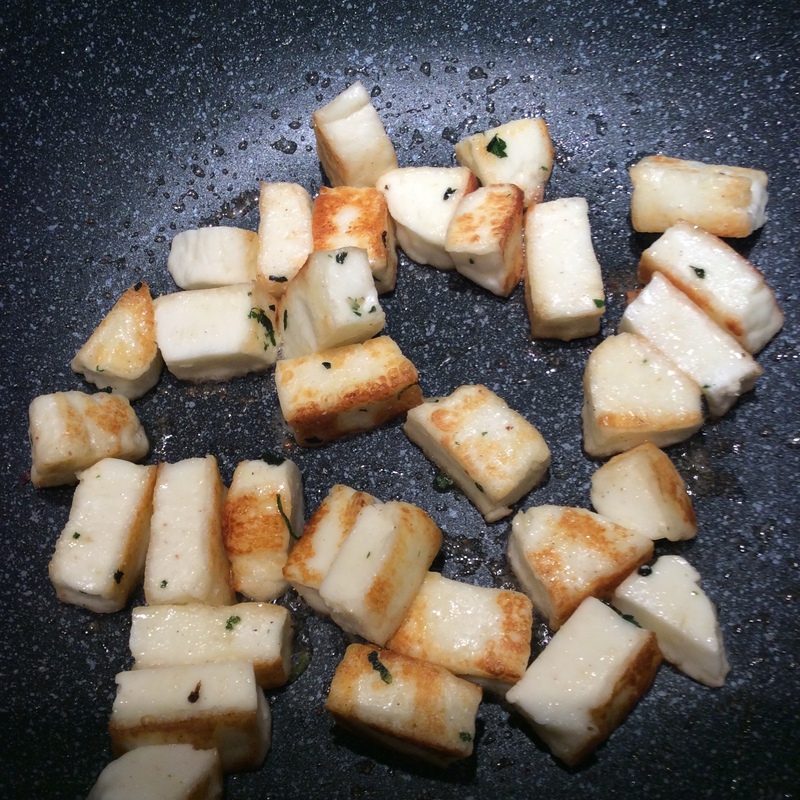 Also, a salted but unseasoned halloumi is an excellent stand-in for paneer if you feel suddenly moved to go Indian rather than Mediterranean. 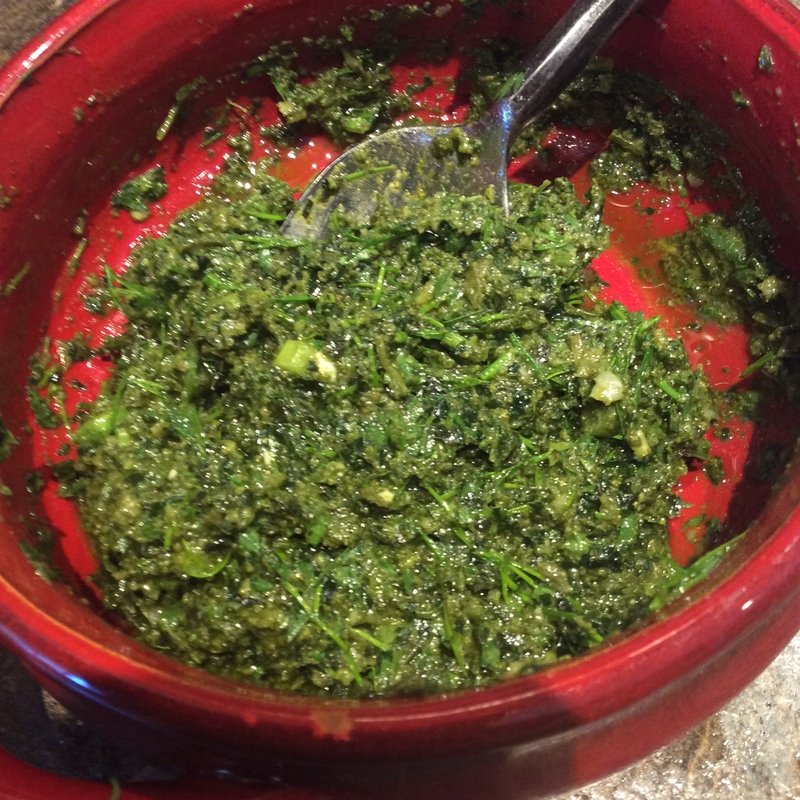 And a wild greens saag paneer with your own greens fed cheese is as delicious a dinner as I know of, and likely to contribute to your health and longevity as well as your immediate gratification. 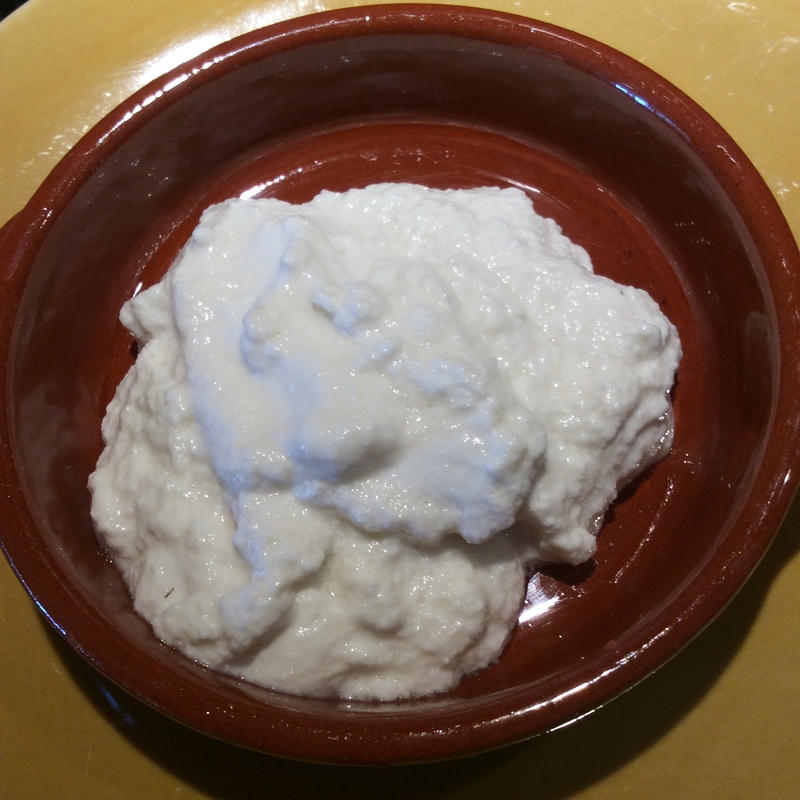 A quarter cup of ricotta is a byproduct of making halloumi, and makes a nice Cook’s Treat to reward yourself for your enterprise. 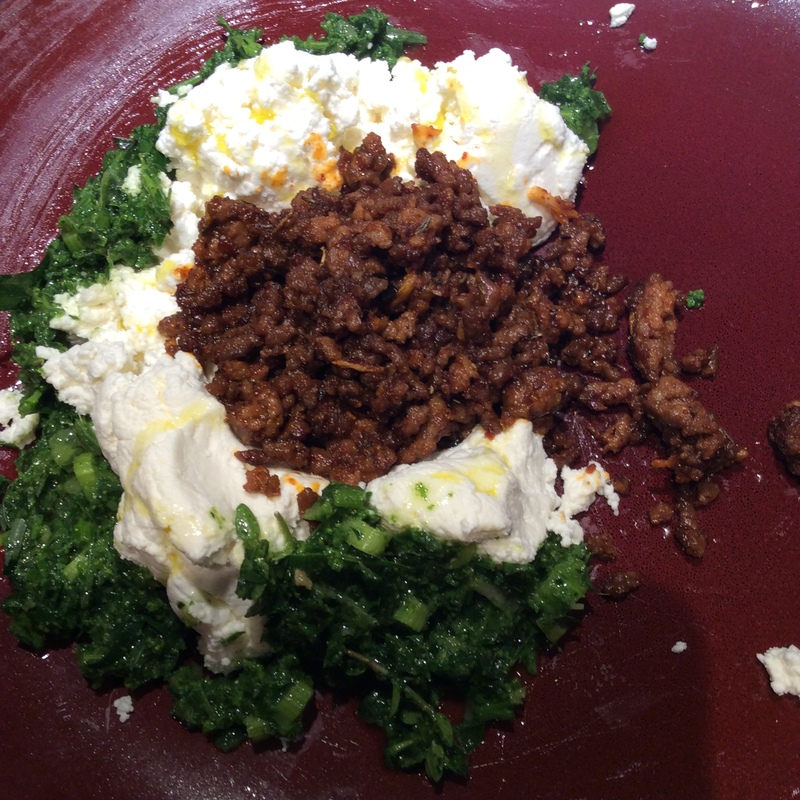 Here, fresh goat cheese serves as the bulk of a dinner, a strongly seasoned ground meat with sweet spices in the Arabic style is part of the flavoring, and an elaborate herb pesto is the other part.